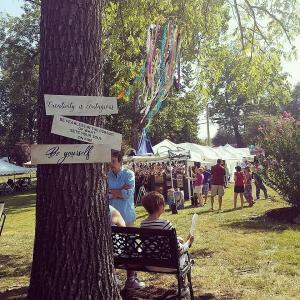 It’s the juried fine arts festival, Art in Speed Park. “We have so many talented artists that have been with us since the beginning, and they’re just like family to me,” said Kim. This year, 25 new artists will join the artist-family that includes renowned Louisville sculptor, Al Nelson. 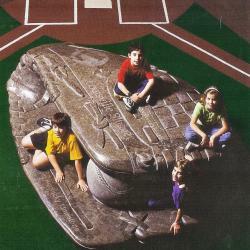 His work includes the Louisville Slugger Museum’s “Let’s Play Ball” giant baseball mitt created with Kim Hillerich. 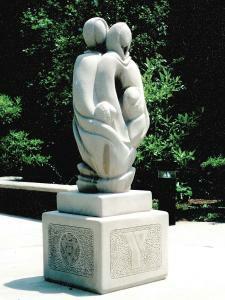 Al’s “Hearts in Harmony” sculpture is at Louisville’s YMCA. 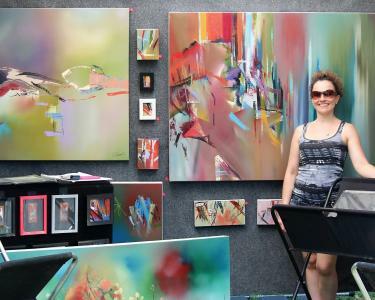 The juried fine art exhibited is not the only art form shared at the event. 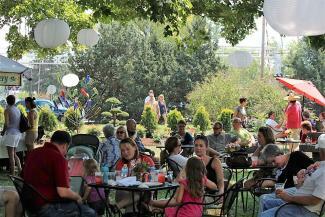 Robby Bartlett and Troubadours of Divine Bliss will provide live music. Food trucks’ yummy creations will give tastes from different cultures. In the wine and beer garden, adults can relax and enjoy wine from Huber’s Orchard, Winery and Vineyards, and craft beer from Donum Dei. Print artist Doreen Dehart creates a unique logo each year to commemorate the festival. The design is imprinted on T-shirts sold at the festival. 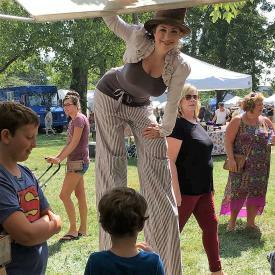 As in past years, stilt-walkers and jugglers will entertain the crowds. It’s a two-day reunion of artists, musicians, performers and patrons—one, big art-loving family. 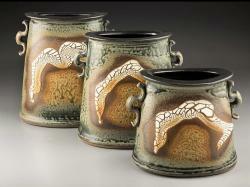 “We always strive to provide quality art, representing true artisans,” Kim adds. Because mass-produced art is readily available, it&apos;s important to Kim and the entire Art in Speed Park family that the event stays true to fine arts. Interested in art? You&apos;re invited to view our Art and Culture attractions and museums. SoIN also has several art galleries.